Seagull Advertising’s Thermax Profetherm Polar Bear Campaign, the only Indian campaign to be featured at the Cannes Lions’15 ACT Responsible wins a prestigious 3rd prize along with a citation at the closing award ceremony of the ACT Expo at Cannes – a platform that recognizes and celebrates creativity for ‘Good Causes’. Marie Pourreyron, Adjointe to the Mayor of Cannes, alongside with Bernard Brochand and ACT’ive members, handed out the ACT Responsible Tributes 2015 in the exhibition in the Palais des Festivals. This expo allowed the people to express their views by voting for their favourite campaigns in 4 categories: Human Rights, Education, Solidarity and Planet. Out of 1000 plus pieces of brilliant work and 88 shortlists from 33 countries this year, Seagull Advertising’s work has earned global recognition, notability and honour. 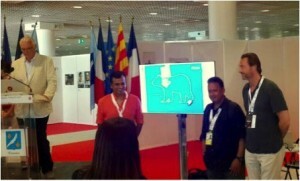 On the final evening of the Cannes Lions’15 ACT Responsible, Seagull Advertising took home a laudable 3rd prize along with a citation for its innovative and impactful Thermax Profetherm Polar Bear Campaign: Unplug to save the Polar Bear, an initiative to promote the Unplug message and create awareness about the perilous effect of global warming through powerful creatives that showcased the Polar Bear and other endangered species. The campaign that was created with a deep insight and a strong message to follow a ’Green Hour’ has truly contributed in saving the planet by urging people to unplug and ACT responsibly.